Agricultural Research Service (ARS) scientists have good news for walnut lovers: walnuts have fewer calories than previously thought. David J. Baer and his ARS colleagues in Beltsville, Maryland, placed 18 people (10 men and 8 women) on a controlled diet and fed each person 2 different diets for 3 weeks, in a random order. One diet contained walnut halves and pieces (42 grams, or 1.5 servings), and the other diet was identical but did not contain walnuts. The participants’ stools were collected for a week, and the total amounts of energy, protein, and fat they contained were measured. When the researchers subtracted out the calories excreted by the participants while on the diet that included walnuts, they found that a typical 28-gram serving actually contains 146 calories, 21 percent fewer than the 185 calories currently assigned by the U.S. Department of Agriculture (USDA). “The results show that when you tease out the calories from the nut from the rest of the diet, the nut is delivering significantly fewer calories than thought,” Baer said. Methods for calculating calorie levels were developed by USDA scientists in the early 1900s. Scientists in the 1950s grouped walnuts and other tree nuts with other plant-based foods, such as dry beans, legumes, and peas, and estimated the calories those foods contained based on the available calories in each gram of protein, carbohydrate, and fat. Rather than calculate the calorie content based on protein, carbohydrate, and fat content, Baer’s team measured the calorie levels in a specific food—walnuts. Baer said the current system for calculating calories generally works well for estimating calories in mixed diets involving several foods, but not so well for estimating calories in certain foods individually, including tree nuts. Baer has also recalculated calorie estimates for other nuts. In previous studies he found the number of calories in almonds was 23 percent less than the standard used for labeling; for pistachios, it was 5 percent less. An AgResearch story on those results can be found here. The study was partially funded by the California Walnut Commission, and the findings are consistent with other recent studies showing that eating walnuts and other types of tree nuts as part of a healthy diet can improve cardiovascular health and reduce the risk of obesity. People don’t always completely chew nuts before swallowing them, and the cell walls of nuts and other plant foods need to be broken down before the nutrients inside the cells can be digested. Baer speculates that the differences between his revised calorie estimates and what appears on nut container labels could be because the nut cell walls are not fully broken down during digestion. But scientists can’t be sure—few studies have focused on how the human body absorbs energy from individual foods, according to Baer. “We’re beginning to understand how plant cell walls affect digestion of nutrients by the body, and nuts are one of the foods now attracting increasing interest,” he said.—By Dennis O’Brien, Agricultural Research Service Information Staff. “Walnuts Lower in Calories Than Label Suggests” was published in the March 2016 issue of AgResearch Magazine. An ARS scientist has recalculated the calorie estimates for nuts. 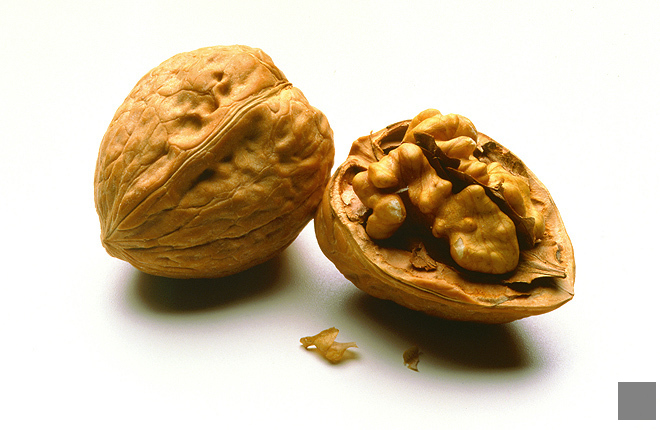 Walnuts have fewer calories than previously thought. Similar results were found in almonds.